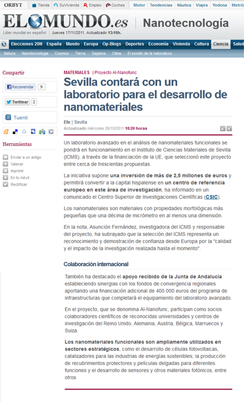 Spain expands its capacity for nano-scale materials' imaging. 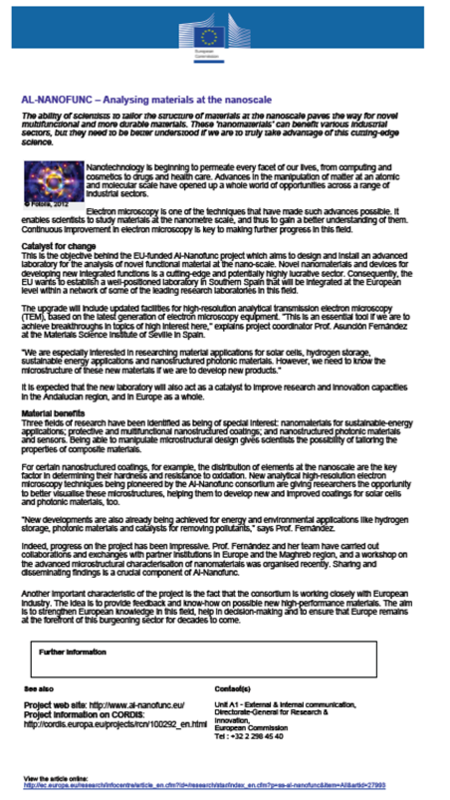 Al-Nanofunc Project has been selected to be reported in an article at the “Success stories” section of the Research & Innovation web page of the European Commission. The ability of scientists to tailor the structure of materials at the nanoscale paves the way for novel multifunctional and more durable materials. These 'nanomaterials' can benefit various industrial sectors, but they need to be better understood if we are to truly take advantage of this cutting-edge science. Nanotechnology is beginning to permeate every facet of our lives, from computing and cosmetics to drugs and health care. Advances in the manipulation of matter at an atomic and molecular scale have opened up a whole world of opportunities across a range of industrial sectors. Electron microscopy is one of the techniques that have made such advances possible. It enables scientists to study materials at the nanometre scale, and thus to gain a better understanding of them. Continuous improvement in electron microscopy is key to making further progress in this field. This is the objective behind the EU-funded Al-Nanofunc project which aims to design and install an advancedlaboratory for the analysis of novel functional material at the nano-scale. Novel nanomaterials and devices fordeveloping new integrated functions is a cutting-edge and potentially highly lucrative sector. 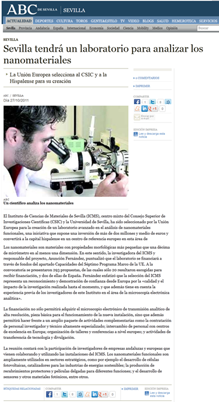 Consequently, theEU wants to establish a well-positioned laboratory in Southern Spain that will be integrated at the Europeanlevel within a network of some of the leading research laboratories in this field. 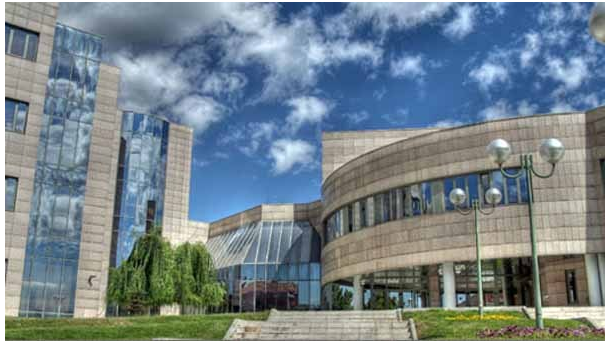 The upgrade will include updated facilities for high-resolution analytical transmission electron microscopy (TEM), based on the latest generation of electron microscopy equipment. "This is an essential tool if we are to achieve breakthroughs in topics of high interest here," explains project coordinator Prof. Asunción Fernández at the Materials Science Institute of Seville in Spain. "We are especially interested in researching material applications for solar cells, hydrogen storage, sustainable energy applications and nanostructured photonic materials. However, we need to know the microstructure of these new materials if we are to develop new products." It is expected that the new laboratory will also act as a catalyst to improve research and innovation capacities in the Andalucian region, and in Europe as a whole. Three fields of research have been identified as being of special interest: nanomaterials for sustainable-energy applications; protective and multifunctional nanostructured coatings; and nanostructured photonic materials and sensors. Being able to manipulate microstructural design gives scientists the possibility of tailoring the properties of composite materials. For certain nanostructured coatings, for example, the distribution of elements at the nanoscale are the key factor in determining their hardness and resistance to oxidation. New analytical high-resolution electron microscopy techniques being pioneered by the Al-Nanofunc consortium are giving researchers the opportunity to better visualise these microstructures, helping them to develop new and improved coatings for solar cells and photonic materials, too. "New developments are also already being achieved for energy and environmental applications like hydrogen storage, photonic materials and catalysts for removing pollutants," says Prof. Fernández. Indeed, progress on the project has been impressive. Prof. Fernández and her team have carried out collaborations and exchanges with partner institutions in Europe and the Maghreb region, and a workshop on the advanced microstructural characterisation of nanomaterials was organised recently. 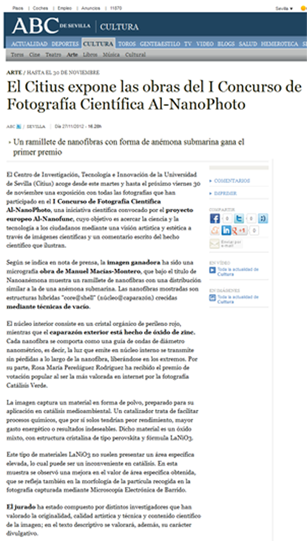 Sharing and disseminating findings is a crucial component of Al-Nanofunc. Another important characteristic of the project is the fact that the consortium is working closely with European industry. The idea is to provide feedback and know-how on possible new high-performance materials. The aim is to strengthen European knowledge in this field, help in decision-making and to ensure that Europe remains at the forefront of this burgeoning sector for decades to come. 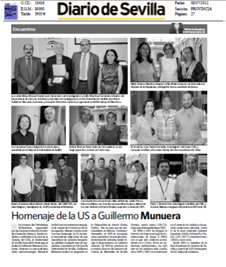 Al-NanoFunc 1st workshop closing ceremony dedicated to prof. Guillermo Munuera in occasion of his retirement.